Margaret Ball's books and art: The die is cast. Les jeux sont faits. The Rubicon has been crossed. I've drunk the Kool-aid....I've spray-adhered the beautiful ombred sheer fabric onto the front of the piece and have begun quilting. 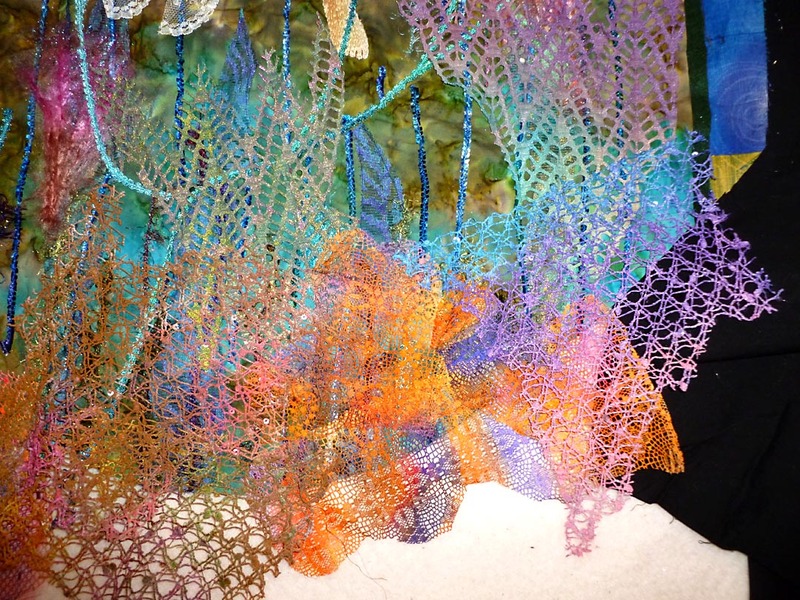 Above is a close-up of the "improved" corals after I added those transfer-painted bits of lace. Everything above the bottom edge of the quilt will be somewhat obscured by the sheer overlay, then I'm going to put some more coral pieces on top of it. In fact, production is momentarily stopped since it occurred to me late last night that it would be a heck of a lot easier to spray-adhere the new corals down and quilt them into place rather than applique-ing them down later. So I'm back to the stage of pinning stuff up, wandering around the room and saying, "Hmmmm...." Fortunately, since the Great Clear-Out, there is actually some floor space in which to wander; I wonder how long that will last? Taking snapshots of the piece and downloading them to the computer seems to help me figure out what arrangements work. Anybody know why this is helpful? I haven't a clue.